Bill Gray Jnr. of Dixons Creek in the Yarra Valley Victoria, he is 55 years of age and started his woodchopping career at the age of 15, he won his first woodchop at 17 years of age. Billy Jnr. (as he is known) has competed throughout Victoria and Australia in his early days. 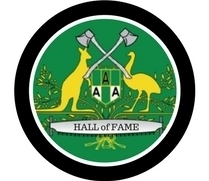 He had been a Central Victoria Axemen’s Association (CVAA) committee man for 29 years and of that was the Treasurer 26 of those years, and held a tight reign on the money, thanks to him that is why the CVAA is a very successful and financial association. For 12 years as Treasurer he never received any honorary fee, it was all volunteered and as his career as an accountant it made for good bookwork and management. Billy Jnr. became a life member of the CVAA in 1992, and his father Bill Snr. was also a life member prior to this, they are the only father and son combination to be life members. Billy Jnr. organised and conducted for many years woodchop competitions at Lylydale Show, Marysville, Ringwood Highland Games and Croyden. Although he was not our top axeman, there were many a time in in Championships he certainly gave them a run for their moeny and even brought home a sash or two, and also in the Handicap events was a very good competitor and won numerous events throughout his time in woodchopping. Billy Jnr is still a member of the CVAA and picks up and axe now and again, but time has come t think of retirement, but still enjoys the odd woodchop and social aspect of the sport that he has been involved in over the last 40 years. His 26 years a treasurer and the time he has given to woodchopping has made him a great ambassador for the sport.